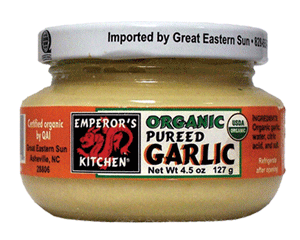 Emperor’s Kitchen Organic Pureed Garlic has a smooth texture and delicious flavor. The ultimate convenience for flavoring all your favorite stir-fries, sautés, and marinades. Just 1/2 teaspoon equals one clove of garlic. 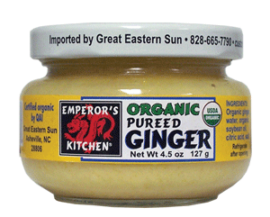 Emperor’s Kitchen Organic Pureed Garlic offers ready-to-use convenience for busy cooks. Enjoy bringing home cooked meals to the table quickly and easily with these great time savers. 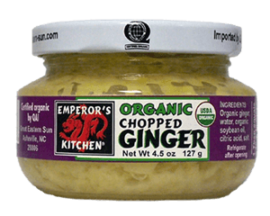 Use Emperor’s Kitchen jarred Organic Garlic products to make delicious stress-free meals that give you convenience without sacrificing quality. You get fresh, good-for-you instant flavor with no fuss, no mess, no odors, and no clean-up – just add to your favorite dishes right out of the jar! Follow the lead of Sandra Lee and other popular TV Food Network hit chefs such as Rachael Ray and Robin Miller whose techniques combine fresh ingredients with selected store-bought items out of your pantry. The result is mouthwatering meals and desserts, prepared in minutes, that taste like they were made from scratch. 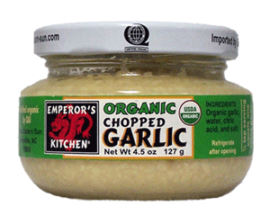 INGREDIENTS: Organic garlic, water, citric acid, and salt.